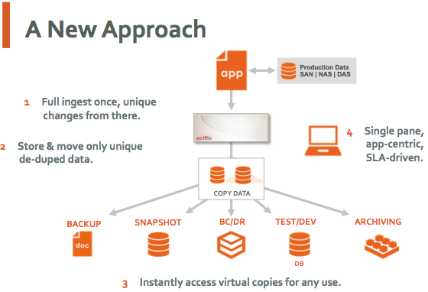 Actifio is radically simple copy data management. Our copy data storage system lets businesses recover anything instantly, for up to 90% less. Actifio eliminates siloed data protection applications, virtualizing data management to deliver an application-centric, SLA-driven solution that decouples the management of data from storage, network and server infrastructure. Actifio has helped liberate IT organizations and service providers of all sizes from vendor lock-in and the management challenges associated with exploding data growth. application data. 100T is a turnkey storage system that comes pre-configured, including Actifio’s software platform and storage. Configurations range from a system capable of protecting 15TB of source application data, up to 100TB environments. 100T integrates seamlessly into any data center, leveraging either the IP network or Fibre-Channel SAN to capture data. 100T will automatically discover applications, physical servers, and virtual servers to capture data. In spite of its significant scale, 100T offers straightforward setup with the industry’s only application-centric SLA-based management. Actifio is particularly well suited for VMware deployments, as it directly integrates through the VMware’s vSphere and vCenter API. Actifio also directly integrates with Oracle RMAN, offering powerful data management for test and development use cases, as well as data protection. And, by off-loading copy data functions like snapshot, backup, clone, and replication from both production storage systems, the 100T enables organizations to achieve greater scalability, improved production performance, and higher system utilization. Data Center Scalability with pre-configured systems designed to manage from 15TB to 100TB of source application data, and up to 1000 VMs in a single system. High-Performance Software Platform keeps pace with large-scale host counts and data sets, from Cloud infrastructures to Big Data implementations. Synchronous and Asynchronous Replication to deliver to the most stringent data continuity service levels. FailoverTest – run disaster recovery test as often as possible using ReadyVM and virtual copies. FailoverSync – Sync back application data from business continuity DR site once the primary site is ready using only the uniquely changed data. Optional 10GbE Connectivity for maximum throughput to capture data from high data volume applications. Application-centric Service Level Agreement (SLA)-based management allows users to define their SLAs in simple terms based on how often they want to capture production data copies, and how long they want to keep them. Network-optimized replication of data allows users to move data over the IP network with up to 70% less bandwidth using patent pending Dedup-Async technology. In-band data capture delivering Fibre Channel speed data capture and management. Out of band data capture frees in-band production data network with straight forward setup and configuration. Incremental forever with zero backup window approach captures and moves copy data efficiently, optimizing bandwidth and storage capacity. Instant data access with no restore window allows users to simply mount their data from the 100T, from any point in time, to get applications up and running quickly. Quick and efficient virtual copies of data are produced with no additional initial storage footprint. Consumer-Grade user experience delivers an intuitive, point-and-click operation for managing data that translates into faster time to productivity. The Actifio product line provides a set of standard and custom configurations to meet any enterprise need. The Actifio 100T starts with a hardware configuration able to protect up to 100 Terabytes of typical production data. 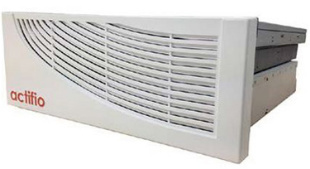 Starting with this flexible, enterprise-class cluster, customers who might be far from typical can add modular storage or processor capacity required to support any application. Need to protect more than 100 Terabytes of production data? No problem. 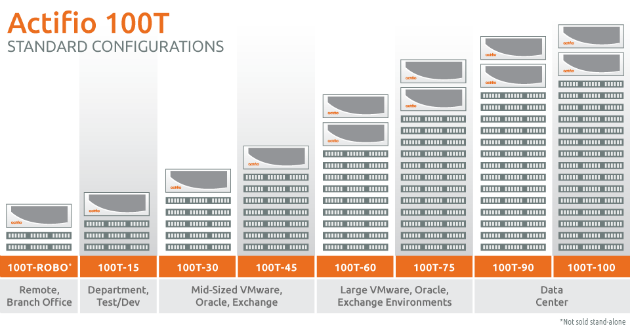 Actifio can combine standard or custom 100T packages to scale up to 2 Petabytes.